On the way back to Alice Springs, after the visit to the Kings Canyon, we decide to go to the nearby West Macdonnell Ranges. We first stop at Ochre Pits -111km west of Alice - a rock formation with incredibly different shades of colours and famous for the presence of precious ochre. The second stop is at Ormiston Gorge. Here we do an hour of beautiful trekking among enormous quartz stones and a waterfall where it is possible to swim. On the way back we make a break at Simpson Gap, 20km from Alice Springs. As the name suggests it is a gap in the canyon, a good spot for the wildlife and it is characterized by the presence of a waterhole. The day after we drive up North. After more than 1000 km from Alice Springs, we stop at the Mataranka Springs (where you can find a campsite with baths, showers and restaurant) and the Bitter Springs - in our opinion less touristy and more suggestive. Both places are free and they really deserve a visit, even just to relax in the warm and pleasant waters after driving many hours. Going north for another 100 km, we finally arrive at Katherine. 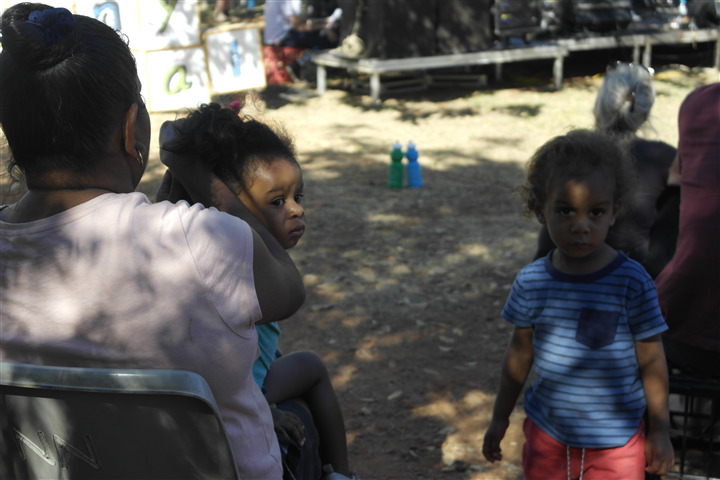 We spend a funny afternoon in the springs of this town with a group of aboriginal children. The older ones speak a bit of English and we interact with them playing their game into the water. It was a really nice cultural exchange! The next morning, we drive 30 min to reach the Nitmiluk National Park where we do a trekking of 4.8km in 1 hour and a half. Later in the afternoon, we move forward to Edith Falls (one hour far from Katherine) where we do another easy trekking of 1.8km to admire these beautiful falls. Here we jump into the fresh and crystal clear waters of the Upper Pool, a natural pool whose water comes directly from the waterfall! It has been a really intensive day for our body! After about 2 weeks and 6000 km driving into the outback, we reach the final destination and the capital of this state - Northern Territory - where the laws are different from the rest of Australia: DARWIN. The period from May to October is known as Dry season; this is the best time to visit the city and surroundings as it is characterized by hot days and cool nights. The Wet season instead goes from November to April and it is featured by moisture and heavy rains. On Saturday morning we obviously can’t miss the local market in Parap where we can find every kind of food. Of course, after eating, there is nothing better than relax at the Alexander Lake - in the beautiful East Point area- where you can even swim, unlike the ocean. Indeed, it is better to avoid the sea because is usually inhabited by very nice crocodiles! The next day we go to Litchfield National Park - about 150km south of Darwin - to admire the beautiful waterfalls immersed in the nature such as the Florence Falls. In the evening we come back to Darwin because we really can’t miss the beautiful Mindil Market, opened on Thursdays and Sundays from 4 pm to 9 pm (only during the dry season) at Mindil beach where you can stare at a stunning sunset. Here you can find everything from clothes to food and aboriginal live music. We must say that the outback has represented more than a simple road trip for us. It has been a mix of feelings, colours, music, scents and most of all people who helped us at any time. We have improved our ability to adapt to any situation and realized that we don’t really need that much to live well. Australia - and this last trip in particular - has made us aware of how lucky we are for being witnesses of so much beauty in the world. We are now full of smiles and unforgettable memories that every single person left us by crossing our way. We just need now to keep following our road - Marsontheroad - and share our adventures with you if you would like to!